Some time back Star Sports India launched an advertisement campaign involving the Indian Hockey Team that was preparing for the FIH Hockey World League semi-finals in Belgium. The campaign #DeshKeLiye sent out a strong message saying that India became the first country to qualify for the Rio Olympics but could not qualify into the hearts of Indians. Needless to say, the plight of hockey in India isn’t that great. Off late, Indian Hockey is crippled with coach issues, financial issues and the worst of all, lack of fan support. At a time when the captain of the Indian Hockey Team features along with the other star players and urges for support, here is a tale of a community for whom hockey for whom is almost everything. This is the curious case of the Kodava Community of Karnataka. Kodavas reside in the border district of Kodagu, also known as Coorg. A place unknown to most of us, I stumbled upon Coorg only when Sandhya Kumar released her documentary on the Kodava Hockey Festival sometime this year in June. Kodavas, an ancient worrier tribe has a long association with Indian hockey. About 50 of them have represented India in International hockey tournaments, seven of whom happen to be Olympians. Noteworthy names here B P Govinda, M P Ganesh, M M Somaiya, and C S Poonacha. The passion for hockey is so much in the region that the Kodava community organizes an annual hockey tournament in Coorg where in as many as 200 families take part. Yes, you read it right, 200 teams for a hockey tournament. This makes it one of the largest hockey tournaments in the world. The tournament is only open to the Kodava community and teams are formed within the same family (surname). There is no age bar or gender obstacle. Anyone to everyone in a family can participate. 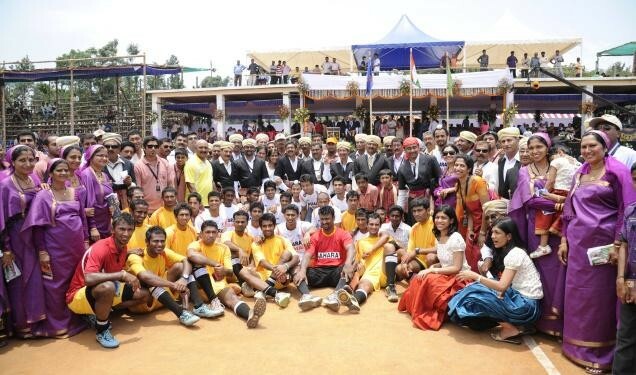 The tournament is organized by the Kodava Hockey Academy and is hosted by one family of the community. There is a sort of bidding that takes place as to which family will get the hosting rights, similar to what happens in case of any big sporting event. The name of each year’s tournament changes according to the family which organizes it. Sandhya Kumar’s documentary, Hockey in my Blood, narrates the tale of the 2013 edition of the tournament, which was called the Madanda Cup (as it was organized by Madanda family). As many as 225 teams participated in the 2013 edition and the number went up to 255 in this year’s edition, where the documentary was screened. A brainchild of Pandanda Kuttappa, an ex first division referee, the tournament started in 1997 with a participation of 60 teams. The philosophy behind the tournament was to bring Kodava families together. And since all of them shared a common passion for hockey, there was no better platform than a hockey tournament. The one month long tournament sees the participation of players from all fields of work. The documentary narrates tales of professionals who have left their IT jobs in Bangalore just to play in the tournament. It’s a very well organized tournament with a football of about 16000 spectators. In fact the final of the 2013 tournament saw about 8000 people in the crowd cheering for their favourite team. It’s also a well funded tournament and organizers managing a budget of about Rs 70-80 lakhs. There is a Government grant of some amount while rest of the amount is usually managed from the corporate sponsors. Since the venue for the tournament is not fixed, each host family works on the foundation of a new ground every year and start from the scratch, from cleaning to rolling. Coorg is place which is really far off. It’s 273 kilometre Bangalore, with connectivity being not that good. Yet the sheer passion for Hockey in the region manages to pull off such a huge turn out every year for the tournament. We have summer camps in our schools, but Coorg has hockey camps ever year after exams. Hockey in my Blood, gives us a brief glimpse of what this passion is. At a time, when the game in the country at large demands public attention, here is definitely a curious case of Kodava Hockey Festival.